1. Deodorize a room. Everyone’s home accumulates gross smells from time to time. Get the stink out with a bowl of vinegar! For persistent odors, simply place a bowl of vinegar in the offending room overnight. If you’re dealing with pet odors, try spraying a mixture of half vinegar and half water onto your carpet. Let it dry, then vacuum. Voila! Fresh-smelling carpets. 2. Revitalize your whites. White t-shirts, socks and underwear can fade with time. Amp up your whites by adding half a cup of vinegar to your next load of laundry. It’ll eliminate any odors and refresh your white laundry. 3. Clean your bathroom. A spray bottle of vinegar is indispensable when you’re cleaning the bathroom. Pour some vinegar in the toilet bowl to make cleaning easy. Spray vinegar on faucets and shower heads to remove mineral and soap buildup. Stop mildew in its track with a few spritzes of vinegar. It really is a multi-purpose cleaning agent! 4. Remove kitchen odors. Get the smell of garlic or onions off your hands and wooden cutting boards by spraying them with vinegar. Allow it to sit for a few moments, then rinse off. You can clean your microwave and deodorize it at the same time by “cooking” a microwave-safe bowl of vinegar and water until the mixture is boiling. This loosens any leftover food and gets rid of pesky smells. 5. Keep your pets at bay. If you have problems with your cats scratching the furniture, keep them at bay with vinegar. Test an inconspicuous part of your upholstery before spraying. If there’s no discoloration, spritz away! The vinegar will keep your furniture free from cat scratches. You can also use this trick to stop cats from jumping up on surfaces around the home. 6. Get rid of stickers or sticky residue. Buying brand-new items often means contending with still-attached price stickers. Instead of wrecking your manicure, simply rub or spray a little vinegar on the sticker. Let it sit for a few moments, then peel it away! The vinegar loosens the bond and makes it easier to remove. Vinegar is a do-anything, clean-anywhere product that costs pennies every time you clean. Pick up a gallon next time you’re at the store and get cleaning! Your home will be cleaner, better smelling and healthier, guaranteed. Vinegar also makes a great organic herbacide. Spray it on weeds to get rid of them. Great tips and I will definitely put them to use. Thanks! Loved your post, especially about pet odors. 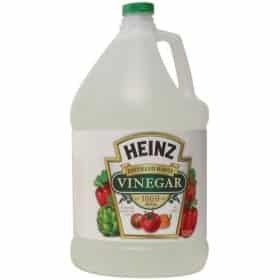 Also another tip, I heard that adding vinegar to your condition rinse will give your hair a natural and sleek shine. Haven’t tried it myself yet. Have to get a bottle of vinegar in the bathroom.